There is an old saying in the recruitment industry, “It’s not the best person who gets the job, it’s the best-prepared person”. At GetReskilled, we see a lot of extremely qualified, smart and capable people struggling to take the right steps and wasting precious time trying to make progress with their job search. To help you avoid some common mistakes, we’ve gathered together some great tips and online resources. Won’t many of the mistakes be rather obvious? For experienced job hunters, yes. However, we have found that they are far from obvious to someone who has been out of the job search process for a while. It is our sincere hope you find the content useful. 1. Starting your job hunt without doing your homework! So you have been thinking of changing careers? The worst thing you can do is dive straight into applying for jobs. There is really quite a lot to do before you get to that stage; don’t damage your chances before you even get started by rushing into applications. Our Job Application Checklist and Tracking Template is now open access – it’s a step by step guide to a career change job hunt, this will literally walk you through the job hunting process week by week. This article talks you through how to use it (with videos). Also be sure to check out our Job Hunt Resource Centre that is packed full of useful articles, checklists, and templates. Sending out lots of applications and not getting anywhere can be demoralizing. 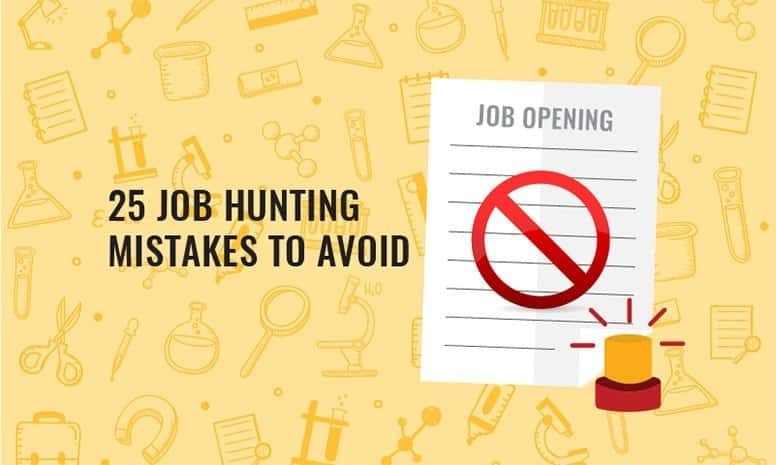 While it might seem like a good idea to apply for any job you see, spending more time on applying to jobs most suited to you will be more fruitful in the long run. The pharmaceutical and medical device manufacturing industries have a wide variety of roles and positions. For people new to the industry, it can be a challenge to identify relevant job roles to suit your skills and figure out your future career pathway. Take a look at our Job Roles and Salaries page for an outline of several different manufacturing jobs as well as the duties, careers paths and salaries associated with each. 3. Having a poorly constructed or badly written CV. First impressions really do last. Your CV is your advert, your window display, your sales pitch – it has to sell you when you aren’t there to sell yourself. A poorly written CV undermines the skills and achievements you’re trying to convey. Put yourself in the position of your potential employer, would you hire someone who couldn’t be bothered to put together a decent CV? Here is a link to an article on how to specifically craft your CV for the Pharmaceutical Manufacturing and Medical Device Industry to help you make that all-important first impression. We also recommend you search online for sample CVs for your targeted role – this gives you an idea of the terminology, tone, and wording that is most appropriate, try to incorporate that into your CV. Once you have a draft, compare it to our CV checklist. 4. Leaving gaps in your work history on your CV. Lots of people out there have gaps in their work history, and they are often at a loss as to how to best present this to any future employer without casting a shadow over their application. One thing’s for sure, you have to think about how you’ll explain your gaps at interview – if they’re obvious, then it’s something most interviewers will ask about. Here is a link to an article on how best to deal with those gaps in employment. 5. Using one standard application. Most hiring managers are extremely busy and will have only a few minutes to look at your CV. You really do need to make an impression in the first few seconds, so the idea of a one-size-fits-all CV is just not going to cut it these days – a standard generic application is very obvious. Your CV is your chance to sell yourself to this particular employer; the things of greatest importance will be different for every application. You need to tailor your CV as precisely as possible to each and every role that you apply for. One of the biggest objections to this is the amount of time this can take – a little time-saving technique might be to draft up three CV templates, each one with a different focus within your targeted area. When you come across a relevant position, use the most relevant CV template as a starting point to tailor your application. Apart from the very obvious typos that you may have missed, not having another pair of eyes critically assess your CV is perhaps one of the most common mistakes we come across. The importance and value of having an outside pair of eyes go over your CV really cannot be overstated! Having a friend or mentor do this is a great first step, but even better is to get honest feedback from a professional recruiter or industry specialist in your target industry, he or she will likely see things that you have completely overlooked. Identify at least three relevant people that you can show your CV to – these need to be people who’ll give you an honest appraisal and won’t just be nice! It can be difficult to ‘put yourself out there’ like this, but it’s better that someone like this spots your mistakes rather than a potential employer! Is the cover letter dead? We don’t think so. Having a well-crafted cover letter that complements your CV shows you have taken the time to research the company and aren’t just applying for any job going with one standard application. There are still plenty of companies (particularly those where the person doing the hiring will have to work directly with you) that will take the time to thoroughly read them. It’s important that you put the time and effort into putting a cover letter together that catches their attention and gets your CV read. Have a look at this article for lots of tips for writing cover letters. It’s often said that many of the best jobs are never advertised. If there’s a role you feel that you have the ideal skill set for or a company where you’d just love to work, don’t just wait for a job to be posted. Why not take a more proactive approach to your job hunt taking advantage of that fact? Build yourself a list of ‘target companies’, do some thorough research and then proactively send in your CV and cover letter or look to make connections. Check out this link to an article from LinkedIn on this. Also, check out our guide to speculative applications. What network? You’d be surprised! If you can make your intentions about changing career known without harming your current employment then do so – speak to people. Ask for advice for a (completely made up) ‘friend’ if you have to. You might be surprised at the connections you currently have … or the connections they have. Look to expand your network too; have a look at using LinkedIn to connect with people within your industry. Here is a link to an article on how to find the key decision makers at your target companies. Start sussing out your current network and their current networks! For help with this, check out our Network Mapping template and this article on how to use it. Chances are, there is always something else you could be researching to give yourself a better shot at a career change. Whether it’s job hunting skills, researching your chosen industry or practicing interview techniques, the internet has endless information for you. Focus on good content from credible resources to utilize your time best. Here are links to another couple of LinkedIn resource to help you on your way. Social media is a vital part of job hunting in the 21st Century. Even if you’re not keen on using it personally, you should consider using it professionally. Whether it’s to make industry contacts, research companies or see job advertisements – your job hunt will benefit from social media. This article gives you an outline of the major social media networks and how to utilize them job hunting. The point above is about social media in general. LinkedIn is arguably the most important due to its positioning for professional networking. Many hiring managers will search for candidates they are shortlisting for a role, a well-crafted page can help to reinforce your key skills and qualities. When you have a LinkedIn profile, it’s important that you keep it up to date and make it easy for people to find you and assess your skills and suitability for a particular role. For tips specific to creating a great LinkedIn profile, check out this article. This is a fundamental mistake that too many people make and it’s one that could genuinely cost you a job. Especially as a candidate moving into a new industry, the specific duties of your previous role are unlikely to be directly relevant to a hiring manager. You can’t even assume that they’ll understand what you’re referencing if the industries are vastly different. You should discuss all previous employment in terms of transferable skills – this is how you can frame unrelated work experience in a way in which a hiring manager can find useful. Check out this article on how to go about doing it effectively. A job advert is likely the only clues you’ll have about the type of candidate a company is looking for before you apply. Luckily, it’s stuffed full of clues on how to impress the person recruiting for the role. More than just looking to see if you “tick the boxes” of their ideal candidate, look at the language they use to describe each point. Make a list of the specific words and phrases used to describe skills and experience in the advert. Every application you send should be tailored to that specific job, one standard application just doesn’t cut it these days. Having picked out the keywords and phrases used to describe the skills and qualities a job advert is looking for, use this exact language to discuss your experience. It’s becoming increasingly common for CVs to be analyzed by computer software as a first screening tool to identify suitable candidates. This also makes sure that hiring managers can easily see you match their criteria. For more info, have a look at this article. When you look to professional networking, you should always consider reaching out to a few local recruiters. More than just knowing about roles that are available, recruiters are likely to know the local job market, what employers are looking for and be able to give you tips on how to sell yourself. The key is to form links with great recruiters. Look for ones in your local area who have a good reputation and who you feel comfortable working with. Technology can be a job-hunter’s best friend. More than just using social media, use any and all available technology that helps automate any part of your job search, try to maximize the number of opportunities that are brought to you every day. Consider signing up for news alerts to hear more about your local industry (your search term might be something like “Ireland pharmaceutical”). Activate job alerts on job posting sites (which will send you an email or mobile notification when a job matching your criteria is posted). Set up email alerts from relevant companies. If you’re taking a course to reskill into a new industry, chances are that you have enough insight and knowledge to start applying for jobs before the course even finishes. We know that our trainees definitely do. Job hunting in a new industry will take time and if you wait until you’ve finished your studies to start, you could be leaving yourself a long time without a job. Ask your course advisor when they would recommend you should start job hunting. To trainees taking our courses, it’s made clear with the introduction of job hunting resources. When that time comes, get applying! Don’t be put off by a lack of self-confidence, you’ve got to start the learning curve of job hunting sometime! A personal pitch is a short, snappy overview of you as a candidate – focusing on showing someone what your key strengths are. Especially as a candidate reskilling into a new industry, there are MANY places you might find personal pitch useful (such as careers events, networking opportunities or the “tell me a little about yourself” interview question). Being able to confidently give a clear and concise outline of yourself, makes it far more likely that someone will remember the “key messages” you want them too. A personal pitch is something you should be working on from early in your job hunt. Start with the 3-5 key messages (i.e. your strengths as a candidate) and work them into a short paragraph. The focus should always be on what you can bring to the employer and NOT why you deserve a job. For a much more detailed overview on how to write a great personal pitch, check out this article. A strong professional network is invaluable in job hunting. The advice and insight you can get from individuals on a one-to-one basis can easily surpass what you’d find after hours of internet research. On top of this, many jobs never reach the point of advertising. Often jobs are filled via personal recommendations or identifying a suitable candidate through a company’s own network. Not reaching out to all available network connections and making your intentions of a career change clear, would be a huge oversight in job hunting. Start by mapping out your network – use this guide to help make sure you’re covering all available options. Then, make a plan of outreach. Make contact with people to discuss your job hunting and hopes for your future career. There are some great resources available around making the most of networking opportunities check out this article, this article and this article for some ideas. The candidate thinks “I better write down every single thing I’ve ever done so the employer can see it all, maybe it will be relevant”. The employer thinks “4 page CV? I’ve not got the time to read that, on to the next”. You can genuinely harm your chances of progressing an application by having a CV that is too long. A short and highly tailored CV will be much more impactful to a hiring manager who’s looking through dozens of CVs for a given role. By carefully choosing what’s most relevant, you make that information much easier to find. No one is searching through pages and pages of CV to try to find evidence that you fit the bill. Ideally, a 2 page CV that is significantly tailored to that specific role is the best way of catching the attention of an employer. Have a look at this article for tips on how to keep your CV to 2 pages. This is a big one – it’s a mistake we see people making ALL the time. You’ve been job hunting for a few weeks and you get an invitation to interview. All too often, people’s job hunt comes to a screeching halt as they prepare for the interview and then wait to hear the result. We understand that it’s tempting to think that of course as soon as you interview, someone will offer you a job. But the truth is that you’ll likely have multiple interviews before you’re successful. And even if you did happen to be successful in that first one, it can takes days to find out and there’s probably another round of interviews to go through after that. Do. Not. Stop. Job. Hunting. Until. You. Have. A. Signed. Contract. Of. Employment. Even if you’ve managed to talk through your previous experience in terms of transferable skills rather than just duties and responsibilities, there’s still more you can do to convince an employer to be the first in that industry to take a chance and employ you. The easiest way to show someone you can be successful in working for them is to show them that you’ve been successful in the past. Include specific examples of achievement on your CV and use figures and additional details to really make these achievements compelling to anyone reading them. The key factor for many people when they job hunt is to find a job in a location that is convenient for them. If you are reskilling into a new industry then you might well have to consider extending your ‘acceptable’ travel distance to land your first job and get some experience. This is an even better idea if there are temporary or fixed-term contracts available. Ask yourself if you could cope with a longer commute for a short or fixed period of time if it meant you could get that all-important industry experience. If the answer’s yes then make sure you’re searching for jobs out-with your ‘ideal’ location or you’ll never know if such an opportunity is available. There is a wealth of information available to job hunters online. Don’t fool yourself into thinking you’re a great job hunter if it’s something you haven’t done for a while. Everyone thinks they know exactly what to do… until they’re puzzled weeks later when it isn’t working. Take the time to read articles and resources about current job hunting techniques and best practice before diving into applications. … and that’s all before you start considering interviews. Be sure and check out the follow-on article to this about interview mistakes to avoid! When you are ready to start applying, remember to check out our Job Vacancies pages where we pull together pharmaceutical and medical device jobs for Ireland, the UK, and Philadelphia, USA. Take care and best of luck with your job hunt!